December | 2012 | JohnBrownJohnBrown! My “winter” roommate is Chef II, for those of you following closely. Gentle, kind, funny and restrained, our friendship over the past 18 months has been quick, easy and balanced. She stands her ground professionally and is fair in the negotiations of friendship. I was never nervous or anxious about sharing the cottage; it kind of just happened and it’s been lovely. Two Saturdays ago was my last in town for the Winter. Julia and I struck out on a gray, cold Friday for the tidal flats on the West End in search of oysters. We were two of about two dozen people total out that morning, most of the others digging for clams. We picked oysters and mussels off the Breakwater rocks and out of the sand. 4 dozen later, we trudged our way back to the car and home. We gave half the catch to friends and set ours outside in the cold shade. The next day, I pulled the bag of oysters off the back porch. Chef made cocktail sauce and I, mignonette. 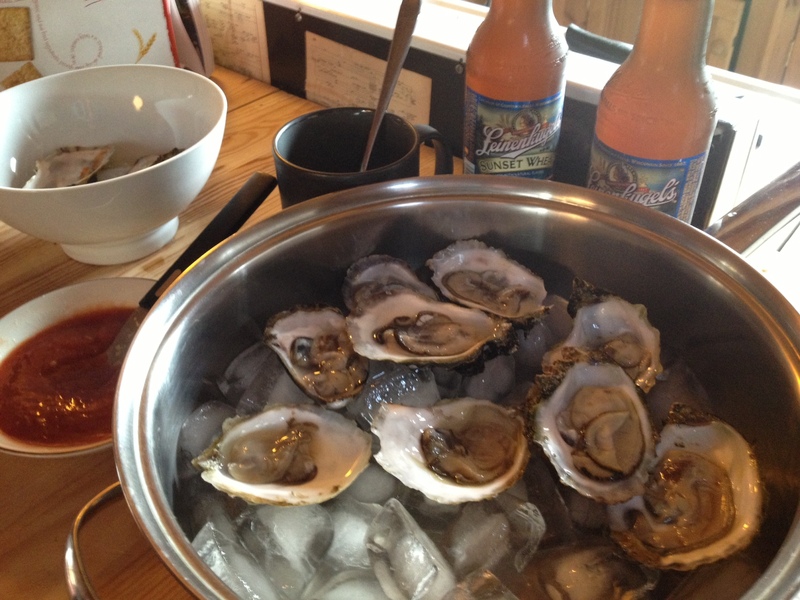 I shucked the bivalves in batches and Julia opened beers. We talked and listened to music, texted friends and savored the fresh, oh-so-slight brine of the cold, slimy creatures, slurping them down easily. Our locally found feast lasted a good hour. It was heaven. Naps followed. The sun set. Contentment reigned.